I’ve been playing Far Cry 4 a lot the last few weeks, and the main thing that occurs to me is that it’s not quite what I expected from the fourth game. I presumed something much different. The Far Cry series has always been about change and experimentation. The first three games, whilst all sharing common elements, are distinctly separate games in tone and feel. 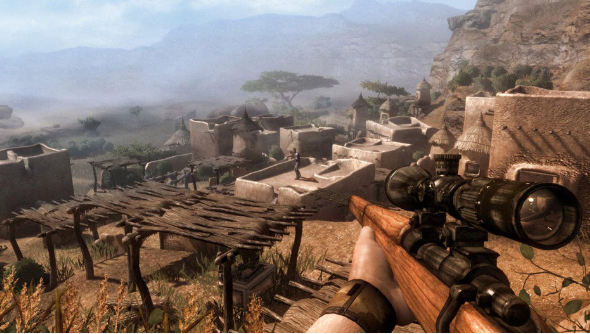 Far Cry 2 is the most obvious when it comes to being different. On the Venn diagram of Far Cry games it is the one that has the most components outside the shared zone. When it released in 2008 it wasn’t fully embraced, with its harsh world and respawning checkpoints seen as a stain on the original game’s fun legacy. But how does Far Cry 2 fit in today, in a world where Far Cry 4 is just more of Far Cry 3, and the shooter landscape is a distinctly different beast? Far Cry 2 is savage. Until you replay, you might not remember quite how savage it really is. You play a mercenary heading into an African war-zone with just one thing on your mind: making shed-loads of cash by murdering an arms dealer. There are layers of story about how this merchant – the Jackal – has been keeping the civil war going by providing arms to both sides, and how you putting a bullet in his skull will help bring peace to the nation. But it’s clear you don’t care. You’re a man who will hold a machete to the throat of any potential information source, a professional killer who will decimate a town in order to bring down a single target. This is about the money, and it’s money that comes in the form of blood diamonds. To get those diamonds, you’ll have to wage war against the entire country on your own. You can undertake missions for both factions enraged in this civil war, but neither will admit to hiring you, and as such the entire population is out to get you. This makes Far Cry 2’s savannah open-world a distinctly harsh, unforgiving land. There’s distrust in everyone’s dialogue, and simply passing a man will cause him to open fire on you. Travelling from one side of the map to another will require you to get past multiple checkpoints that will always be manned by soldiers ready to give chase, and it makes commuting consistently stressful. You may be the hunter, but there’s an entire nation hunting you, too. Shootouts are difficult. Guns rattle around with inaccuracy, and begin to jam and misfire as they collect dirt during your travels. There’s a unique desperation in trying to free a jammed shell from the breach whilst under fire. Shooting a rocket launcher into a vehicle convoy may seem a great quick-fix, but when the backblast sets fire to the dry grass behind you and you’re suddenly ablaze the decision becomes regretful. Get shot and you’ll have to perform excruciating field surgery whilst cowering behind a jeep. The muted brown colour palette makes it hard to track your targets among the trees and grass. It’s a hundred worlds away from Far Cry 4, where all your enemies wear bright red uniforms for easy identification. Playing Far Cry 2 six years after release, this kind of combat feels distinctly more familiar now than it did at the time. 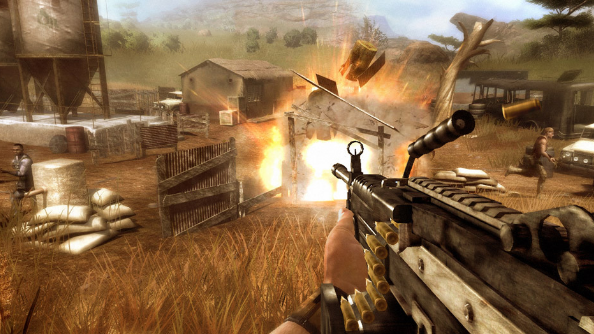 Difficult is in vogue, and the gun battles in Far Cry 2 remind me of the struggles of Dark Souls. With no checkpoints or auto saves, unless you’re vigilant with the save system dying can mean having to retread an hour of progress. Death has significant consequences, and that works as a teacher to encourage a more deliberate, careful approach to the world. Outwit its systems and you’ll live another day. 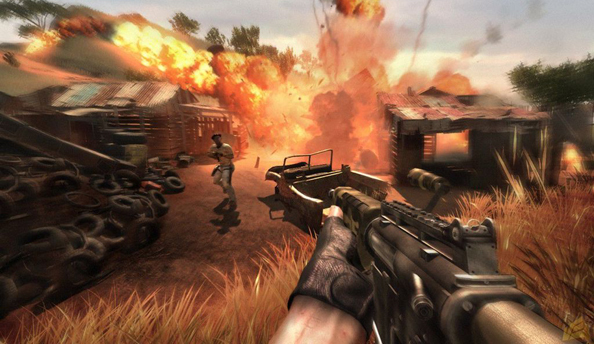 Far Cry 2 is also made up of the DNA of today’s most popular survival games. Fights are desperate scrambles. People are the biggest danger out there. Far Cry 2’s lack of minimap and fast travel means you need to travel everywhere in real-time and through the use of physical in-game maps. They’re maps that don’t rotate based on your direction, and that don’t zoom; you frequently have to tear through pages of an atlas to find the right scale of map for the information you need. Combined with using landmarks and street-signs for navigation, this distinctly reminds me of navigating DayZ’s Chernarus map, using downloaded maps and rail-station signs as references. It’s a single-player survival game, then. It just came out half a decade before people had developed a taste for them. You don’t have to fend off hunger, true, but something worse than starvation looms over you at all times: malaria. Forget to keep stocked up on medicine, and you’ll be stumbling around in the heat of battle as fever rages through your body. Far Cry 4’s set up is broadly similar to its grandfather: sent into a strange and unfamiliar land submerged deep in the blood of civil war, with the aim of assassinating the man responsible. And yet, whilst Far Cry 4 does everything it can to make its word atmospherically hostile, it’s a fun-time playground of discovery, amusing car chases, and exploding elephants. And that’s just fine, because that’s exactly what it was designed to be. Far Cry 2, through lining its systems up with the narrative, genuinely creates a hostile and unnerving world. You play a savage in a savage land. It’s a rough, haggard game in the best possible way, that thanks to altered trends stands up much better today that it did at launch. It’s by far the most interesting Far Cry has ever been, and now more than ever is the perfect time to revisit its savannah.